Medium- and large-scale multi-service IP networks require maximum reliability at the central site. 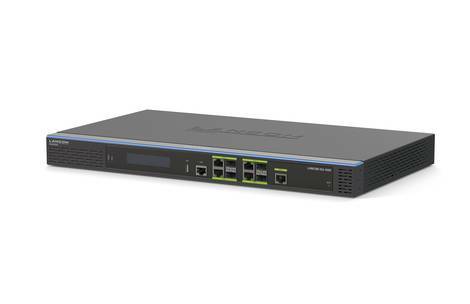 The LANCOM ISG-1000 is a powerful platform offering state-of-the-art encryption technologies, freedom from backdoors, and redundancy functions that make your VPN solution highly secure and fit for the future. Use SD-WAN to effortlessly connect your sites, branches, and remote workers. You can also upgrade this integrated services gateway with additional features such as a hotspot, clustering, or additional VPN channels. 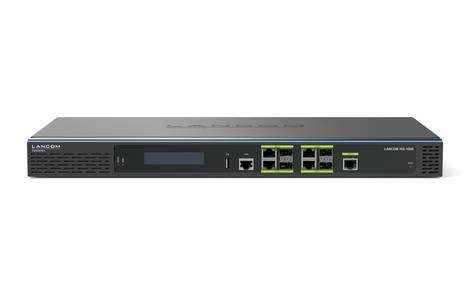 The LANCOM ISG-1000 is the central instance of your network infrastructure. 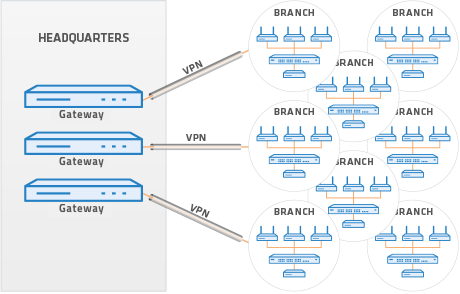 Reliable security for medium to large enterprise scenarios, state-of-the-art encryption technologies via 100 integrated VPN channels, and the demand-oriented ports (4x combo ETH/SFP, 1x Ethernet and 1x USB) give you optimal conditions for networking mobile employees, protecting your internal company data, and securing sensitive network segments or branch offices. The LANCOM VPN option upgrades the gateway to support up to 200 VPN channels. This ensures that your network is perfectly scalable and can grow on demand—without requiring additional hardware. The independent user survey “Professional User Rating Security Solutions (PUR-S)” gave LANCOM top marks in the corporate and solution ratings in 2018. 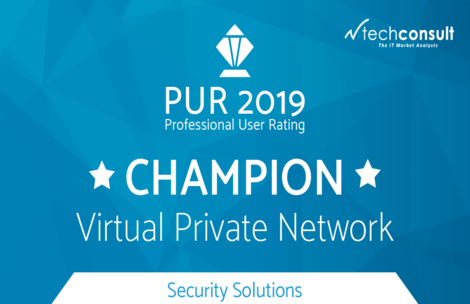 This was a successful title defense by LANCOM: LANCOM had already received the “Champion” award in the previous year, emerging from the survey as the best-placed VPN provider. From fiber-optic to Ethernet and USB ports: As the core of the network, this integrated services gateway enables an endless range of applications. You benefit from four combo ports with Ethernet and SFP interfaces, giving you the freedom you need. 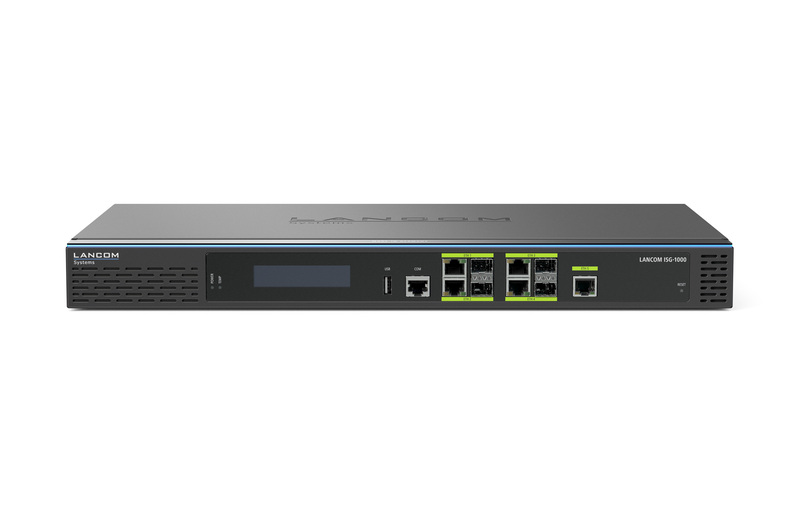 The LANCOM ISG-1000 integrates features that go far beyond routing and monitoring, making it a universal tool and a reliable component of your network. The LANCOM ISG-1000 comes in a high-quality all-metal housing with an integrated power supply unit. Thanks to the mounting system, it is easy to install in a 19" rack—featuring connection ports redirected to the front, it is quick and easy to work with. The display on the front of the device provides a continuous overview of various information including the temperature, CPU load, and the active VPN tunnels. You can see in an instant if your network is operating properly or if you need to act. LANCOM integrated services gateways are the basis for secure encrypted site connectivity and high-speed Internet access. As professional system components, they are fully compatible to all LANCOM network devices and they facilitate flexible scaling and expansion when combined with further LANCOM components. The result is a secure and flexible all-round solution that you can rely on. The overall network down to each individual device can be managed and monitored from a central instance—for a solution that is systematic. You can also upgrade this integrated services gateway with additional features such as a hotspot, clustering, or additional VPN channels.